I’ve read three really great books this month. The half brother by Lars Saabye Christensen is a a huge story, both figuratively and literally, that focuses on the lives of a family in Norway. It’s really well translated and probably the best thing I’ve read in a long time. I can’t really think of how to describe this book in a way that will do it any sort of justice. It’s a story about four generations of family. It’s a story about strong women, about weak men and about interesting relationships. It’s also a story about so much more. If you’re looking for something meaty to sink your teeth into, this is a good one. 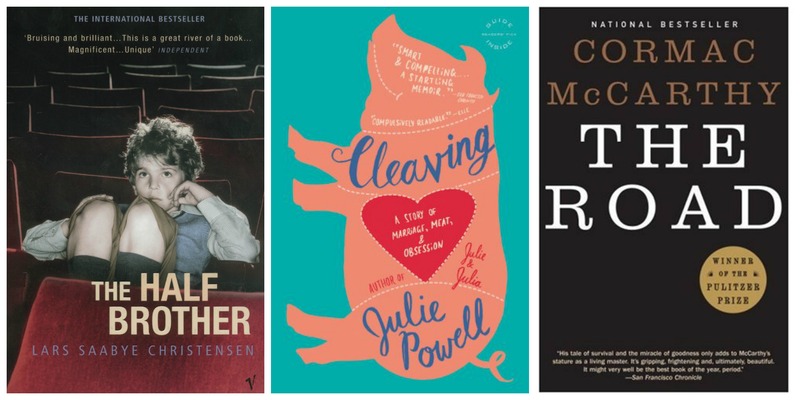 Cleaving, by Julie Powell is the book she wrote after Julie & Julia made her a bit famous. It’s mostly about her apprenticeship as a butcher but she also touches on the (many) affairs she had while married. I detested the way that both her and her husband were so disloyal to one another. But I was weirdly fascinated by her tales of cutting up animals. The art of butchery really is dying, with meat factories now replacing this old skill. I started to think that maybe I too wanted to become a butcher. Then Ian reminded me of my inability to enter a butcher shop without gagging. Also, despite my love of cooking, I’ve never EVER touched raw meat. So there’s also that. The Road, by Cormac McCarthy is a tale of a father and his son, set in a post-apocalyptic world. It’s somehow a terrifying scenario written in a really beautiful, warm way. Husband recently read this book and was surprised to find himself crying at the end of it. In the 19 odd years I’ve known Ian, I’ve only ever seen him get choked up a couple of times. I knew that if a book could make him cry, it was a book worth reading. I loved the tenderness between the father and the son. Despite living in a terrible world, they share the most beautiful of relationships. And for me, that’s really what life is all about. Love these reviews. I have seen The Road film which was bleak and harrowing so it would be interesting to read the book and compare the tales. I think you’d really like The Half Brother. You should give it a go. You like big books and this is a great story!